Simply said, it’s an internet wallet (e-wallet) such as PayPal. This service is free of charge and offers one of the fastest and safest ways of money handling. Skrill can be used for payments, shopping and money transfers online, but not only online. You can even use it to pay for food in your local grocery store. This London based company has 36 million users worldwide and is one of the leading internet money provider service. On your Skrill account, you’ll find a detailed overview of all your transactions, whether it’s shopping, deposits, payments or money transfers. They also offer customer support, if you have any questions, feel free to contact them. One of the biggest advantages is that whenever someone sends you money, you’ll have it in your account in the matter of seconds and then you can use it for shopping or anything you want. First thing you need to do to be able to use digital wallet Skrill is to register and then, nothing stops you from shopping or transferring your money online. Isn’t it easy? You withdraw your money from your Skrill account to your bank account with a wire transfer and then you can use it as you wish, i.e. : pay in stores or withdrawing from ATM. 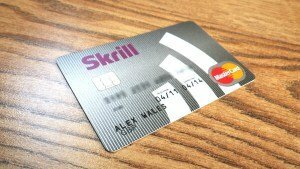 Skrill also offers an option to use their Skrill prepaid card, which can be used as any other debit card, so there is no need to transfer your money to your bank account. Account registration with Skrill is free. Depositing to Skrill through bank transfer has no fees. Deposits done by credit cards Visa, Mastercard have a fee of 1.9% from the deposited amount. After registering for your Skrill account you can ask for a Skrill card. Prepaid Skrill card is available in the following currencies EUR, GBP, USD or PLN. Fee for your Skrill Prepaid MasterCard is 10 € that is going to be deducted from your Skrill account once a year.